Well, there are a number of great reasons you should know about that really do set us apart from other city centre self-catering accommodation providers throughout town. We're in a unique position to offer you fabulous Georgian townhouse apartments, often 2-3 times the space of other self catering properties that will wow you with their setting and 3-dimensional space - but at normal competitive self catering prices. Open plan style of our Regent Apartments, with high ceilings and floor to ceiling windows makes for a wonderful feeling of 3-dimensional space. 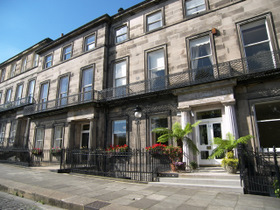 Our 1820's apartments on exclusive Regent Terrace, designed by famous Edinburgh New Town architect William Playfair, are something special. Exceptionally spacious and beautifully lit with floor to ceiling windows. Guests sometimes tell us that at first glance they were unsure about enquiring. Surely, such lavishly appointed apartments must cost the earth - they seem like they must surely not be a cost effective way of self catering in Edinburgh city centre? However, being family run and owned, means that we are able to offer this wonderful experience for the same regular prices you might pay for an apartment of literally a third of the size from another provider. The only downside is that these apartments do tend to be in high demand, so get in and book early. Wonderfully relaxing and secluded yet central location - Edinburgh self catering holiday accommodation with a touch of tranquillity. Regent Apartments, our apartment complex on Regent Terrace sleeps from 2-5 people. Various configurations of apartment are available. Though right on the cusp of Edinburgh city centre, you can breath easy and settle back in one of the most convenient yet secluded districts in central Edinburgh - Regent Terrace is lined by trees on one side with views over to Arthur's Seat, Holyrood palace, Dynamic Earth and the Scottish Parliament at the foot of The Royal Mile. Princes Street is just 7-8 minutes' walk away on the level with lovely views over the city. 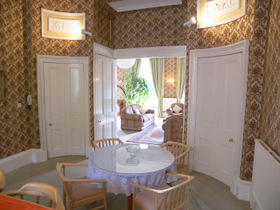 We feel this is quality Edinburgh self catering holiday accommodation with a little something else to offer. A home from home - as you would expect, you can come and go as you please. Each apartment is fully equipped with facilities which include Wi-Fi Internet access, freezer, fridge, linen, microwave, towels, TV, Freeview, DVD player and washing machine. 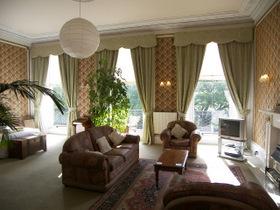 Therefore these apartments offer self catering accommodation in Edinburgh ideal for being entirely self-sufficient, and indeed are perfectly placed to accommodate families or groups on longer holidays or business customers who are staying away from home for the week. Lots of little extras are included in our competitive rates, such as bed linen, towels, kitchen towels, toilet rolls, soaps, and a grocery starter pack which includes tea, coffee, sugar, milk, cooking oil, orange juice, preserves, spreads and bread rolls. Help on hand if you need it from friendly owner John and his "little helpers". 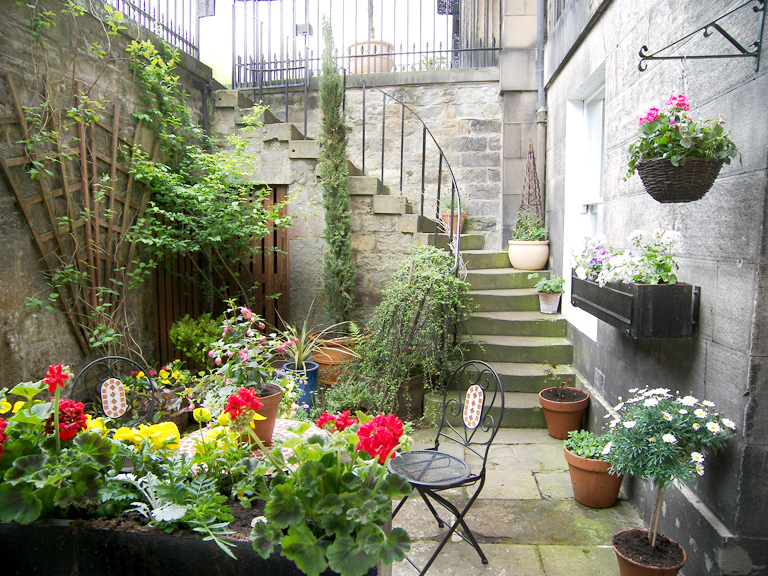 John has been self catering in Edinburgh city centre for 20 years, carrying on from his Mum. Our patio apartment and garden apartment offer alternative accommodation and can sleep from 2-6 people. His Grandmother used to run a bakery down the Royal Mile, creating batches of fresh scones and pastries. He knows the city very well and can make recommendations and provide directions. If you are seeking self catering holiday accommodation in Edinburgh for an extended stay of 7 to 14 days, or if you are planning on staying mid-week, especially during off-season months of October to May, then we are often able to lower our rates. Depending on season, we are often able to offer self catering accommodation appropriate to most group sizes. Find out about availability for your chosen apartment now! We're generally available to take your enquiry from 8am - 9pm, 7 days a week. Please visit the contact page, and either drop us a call or fill out the form with your requirements.